Sean Penn's Haitian Palace Demolition: Why? Urban planner Vanessa Leon writes in Urban Times that the decision of the Haitian government to demolish the National Palace, which was destroyed in the country's 2010 earthquake — with Sean Penn's charity volunteering to do the work — leaves too many unanswered questions about what will become of the historic site. The news of the demolition was also disturbing in that it did not come with a commitment to engaging Haitian design professionals. Often times, because Haiti relies so heavily on international assistance, external entities and individuals are able to wield more influence over Haiti's present and future affairs than its own people. The situation over the palace is the latest example of this reality. In the same manner that Mr. Baussan's 20th century rendering for the national palace emerged from a design competition, Mr. Penn and the Haitian government should provide a similar opportunity for modern-day Haitian professionals. Haitian architects and designers should be able to contribute their leadership and skillsets towards this historic rebuilding. I understand the pressing need to uphold Haiti's public image and to restore its collective psyche. If demolition is pushed along without a follow up strategy however, it will be too easy for a project of this nature to stall. 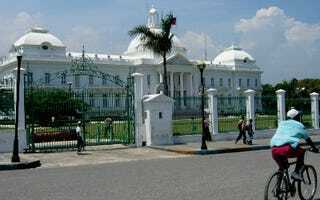 When all is said and done, if the crumbled palace currently stands as a national embarrassment, without a plan or a timeline for completion, I wonder what no national palace will symbolize for Haiti and for how long. Read more at Urban Times.